We are starting off the year with a few new features in Picasa Web Albums. From metadata, to security, to a new way to zoom, there is a little bit for everyone. For those of you who can’t get enough of the technical side, we expanded the EXIF metadata (information stored inside of your image file) you can view for each photo. You can now get over 200 EXIF tags that are available from your photos including Metering Mode, White Space and Color Balance. From the individual photo page -- where you currently view ‘Photo Information’ like Camera, ISO, Aperture and Exposure -- click on “full details page” to view this new metadata information. Now, you can view images in their full resolution splendor by clicking on the magnifying glass on the photos page. 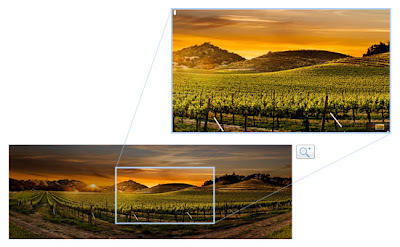 This will bring up your image in a lightbox view, from which you can zoom into the image, up to its full resolution. You will need flash to take advantage of this new feature. This works great for panoramas too. Thank you to Mike Wiacek for this beautiful image.